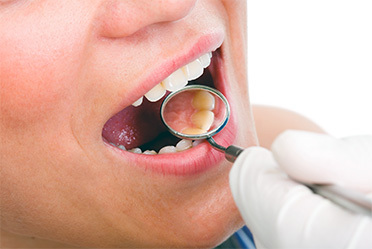 Periodontal disease or gum disease is an infection of your gums, which begins when bacteria accumulate at and below the gum line. Your immune system reacts as it would with any bacterial invasion. The process of inflammation starts and then the white blood cells start moving in to do battle with the bacteria. All this chemical warfare destroys the attachment of the gum tissue to the root of the tooth and can eventually dissolve the bone that holds your teeth in the jawbone. When bacteria is undisturbed, it begins to mineralize and this hardened material above and below the gum line is referred to as tartar or calculus. This build-up of calculus irritates the gums further and is a great place for new plaque to form and cause more problems. It is a vicious cycle and is often painless until the later stages. Periodontal disease can have wide spread negative effects on your health, but the good news is that Dr. Hudon uses many ways to treat this very common and devastating disease that are more comfortable and effective than ever before! Removing this mineralized material is the goal of scaling and root planing which is commonly referred to as a “deep” cleaning. It really just means removing the plaque and calculus and smoothing or planning the roots until they are clean and smooth. Removing the bacteria and calculus is an important step in helping the body’s immune system fight back and this step is included in all our treatments of gum disease. It is the second step in the FDA approved LANAP protocol that Dr. Hudon uses to treat early, moderate and advanced gum disease. Sometimes it is all that is needed for treatment of early periodontal disease. Dr. Hudon will always make sure you are comfortable and pain free during any procedure you need! Excellent home care is needed afterward to achieve the best results and Dr. Hudon and his staff always recommend brushing at least twice daily with a very soft tooth brush and cleaning in between your teeth twice daily with any of the aides available including floss, proxabrushes, and other interdental toothpick-like devices. In addition to excellent daily oral hygiene, Dr. Hudon and his staff encourages patients treated for periodontal disease to have professional hygiene care every three months to remove any new bacteria and new calculus that may have accumulated despite your attempts at self-care. These visits also give us an opportunity to reinforce oral hygiene techniques, check and treat any new areas of infection, do oral cancer screening, and check for cavities.